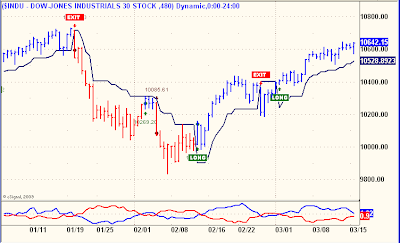 No, I am not going to put up a DJIA chart every day. 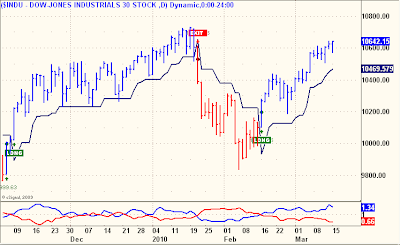 What I mean is that since yesterday I put up a short term 5 minute bar chart of the DJIA and today I'm putting up a Daily bar chart of the DJIA. Does either chart help in trading the markets? That's a personal answer, depending on how you trade. For me, a resounding Yes, they both help in their own way, especially as the patterns resolve with subsequent price action. Perhaps less clear, the value of a 390 minute bar chart, or my preference, 480 minutes (below) which although technically is a 1.25 Day bar chart, does present some interesting contrasts to the Daily bar chart. More on this in future Blogs, a confirmation and non-confirmation kind of rock and roll.